There’s an obvious divide between Tebow supporters and Tebow haters. I’d like to preface that I am not a hater of Tebow the person. But I have yet to be convinced that Tebow is a legitimate professional quarterback. So when the Jets offered to trade for Tebow, my mouth dropped. Did they not just offer a contract extension to Mark Sanchez? Why are they bringing in Tebow, who wants to be a starting quarterback, if Sanchez is their number 1? How are they going to use him? These are questions I asked myself. Mark Sanchez is the starting quarterback. Tim Tebow will NOT be competing for the starting spot. According to Tannenbaum, he has assured Sanchez that he is the Jets starting quarterback from here on out. He has told Tebow that he will not be competing for the starting spot. So why would they bring in a guy who–to some people–has proven he can be a starting quarterback? Not only that, but the Jets just signed Drew Stanton this past weekend to be the Jets backup (and promised him they weren’t going to sign another QB). What’s the point? The only reason I could come up with is the Jets are trying to light a fire under Sanchez. This is their way to get him to work harder and play better because the most popular guy in the league (not the best QB) is just 1 interception away from taking his starting spot. If I’m Mark Sanchez, I’m angry. The relationship between QB to coach and QB to GM just became a bit more rockier. The Wildcat is back. So what are the Jets going to do with Tim Tebow? According to Tannenbaum, the Jets believe Tebow will be great for running the Wildcat. Rex Ryan believes that this is still a viable option and Tony Sparano, who ran the Wildcat in Miami, will be able to execute it. First, I have the utmost respect for Tony Sparano. (Side note: he’s my former college roommate’s uncle!) But the Wildcat only worked a few times with the Dolphins, and that was when he first implemented it in 2008. 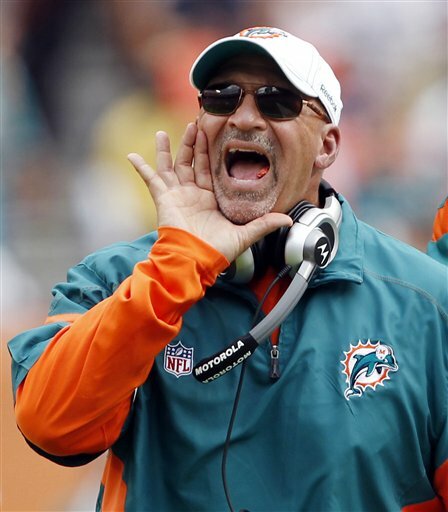 Sure enough, the Dolphins went from worst to first and Sparano was considered coach of the year. What happened after that? Teams figured out the Wildcat and the Dolphins had losing seasons the next 3 years and Sparano was fired. Is the Wildcat really back? Tim Tebow running the Wildcat. You can argue that Tebow would work as the Wildcat leader. In Denver, he proved that his legs are more valuable than his arm. But if I’m the Patriots, or any other team who will play the Jets, and I see Tim Tebow behind center, I will automatically know Tebow’s there to run the Wildcat. As a person who never played football, I don’t know if it’s hard to defend the Wildcat or not. But I have to think that knowing what’s coming is half the battle. Now, you can continue to argue that having Tebow behind center also gives the Jets the option to throw the ball; you don’t know if it will be an actual run play or a pass play. But Tebow isn’t a very good passer. His accuracy on pass plays 20 yards or more disappears. If I’m on defense, I’d defend the run and short passes. (Once again, I’ve never played, nor do I watch tape, so please correct me if I’m wrong about this.) Not only that, but if you’re bringing in Tebow to run the Wildcat, then you’re taking away snaps from your starting quarterback. Am I wrong, Dude? How will Sanchez feel about that? Also, what’s the point in paying a backup quarterback like Tebow to play 2-3 snaps a game? The Jets locker room is a black hole. I don’t like seeing teams not playing as a team. I’m a sucker for stuff like that. And watching the Jets locker room unravel was not fun. Santonio Holmes stopped playing. Derrick Mason was traded after speaking his mind about the dysfunctional offense. Just yesterday, Antonio Cromartie tweeted the Jets should get more weapons for Sanchez, not get Tebow–can’t wait till those two meet! If you think the Jets are all of a sudden going to be holding hands and singing, “God is an Awesome God,” then you better think again. As we saw last year, Santonio Holmes wants the ball and if he doesn’t get it, he’s not helping the team. 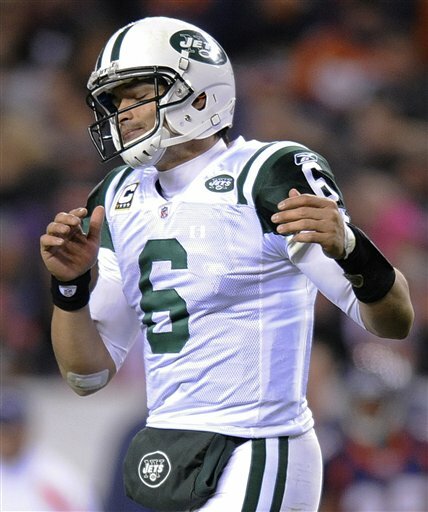 Personally, I think Holmes has a better chance of getting the ball thrown to him by Sanchez than by Tebow. Also, what about Joe McKnight? If you’re McKnight, wouldn’t you be mad that you’ll be splitting plays with Tebow because they’d be better executed in the Wildcat formation? They’re creating a formula for disaster. Tebow worked in Denver because John Fox was willing to change his offense around for Tebow. But as events unfolded this week, I think it was obvious the Broncos knew it wasn’t going to last forever, which is why they went all out to get Peyton Manning. Why would the Jets change their offense for Tebow and alter other players roles on the field? Tim Tebow is not a good professional quarterback. I almost feel like I could write a thesis on this. Notice I say “professional” quarterback. I don’t doubt that he could possibly be the greatest college quarterback to ever play the game, but college is not professional. No one else wanted to trade for Tebow except for the Jaguars and possibly Miami. And as far as we know, the only offer Jacksonville put in happened when the Jets trade almost fell through. I’d like to believe that other teams realized Tebow is not going to answer their prayers (no pun intended). He is not a long-term quarterback. So why would the Jets sign a 3-year contract for a backup with guy who wants to start? To quickly explain why I don’t think Tebow is a good pro quarterback, let’s look back at the Broncos-Steelers game in the Wild Card playoffs–a game Tebowmaniacs uses to prove that Tebow can legitimately be a starting QB. The Broncos did not win that game. The Steelers lost that game. The only good play Tebow had was that touchdown pass to Eddie Royal. Honestly, I believe that if Ben Roethlisberger was healthy, Casey Hampton and Brett Kiesel didn’t get hurt in the first quarter, and Ryan Clark played that game, the Steelers would have won. Shoulda, coulda, woulda. 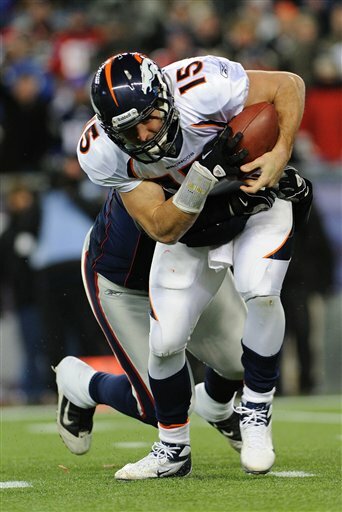 I like looking back at the Broncos-Patriots playoff game where Tebow was dismantled. If Sanchez loses his job for some reason, I think you had a perfect preview of what will happen to Tebow at least twice a year. I’m at a catch-22 right now. I don’t want Tebow to be the starting quarterback of the Jets because I don’t want to hear about “Timsanity.” On the other hand, I do want him to start so people can see that the Broncos defense, Matt Prater, and the thin air in Denver were a big part of Tebow’s success. But I still can’t put my finger on what was going through the Jets’ heads when they traded for him. There’s only one reason I could come up with–which Tannenbaum vehemently denies was a factor in the trade: Make the New York Jets the spotlight of New York City again. Who just won the Super Bowl? Who cares! Tebow’s in town! You can already purchase Tebow jerseys on NFLShop.com right now. Am I completely off-base? Do you think Tim Tebow will fit right in? Let me know what you think, because I don’t get it!